Happy Birthday to Gail Gibbons (The Reasons for the Seasons, The Vegetables We Eat), Jim Arnosky (Crinkleroot series), and Jane Hissey (Old Bear series). It’s also the birthdate of Edgar Rice Burroughs (1875–1950), author of Tarzan of the Apes. In 1914, it was the last day of life for the last known passenger pigeon, Martha (named after Martha Washington) who lived in the Cincinnati Zoo. Read Grandmother’s Pigeon by Louise Erdich, illustrated by Jim LaMarche. It’s National No Rhyme (Nor Reason) Day! Read Norton Juster’s The Phantom Tollbooth. International Enthusiasm Week kicks off today! Read Yo! Yes? by Chris Raschka. September 1 has been set aside to celebrate International Primate Day. I can think of no better way to mark this day than look at the life of Jane Goodall, who has devoted herself to the study and the conservation of chimpanzees. 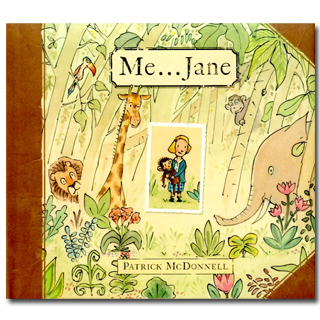 In 2011 Patrick McDonnell published an exquisite picture book Me . . . Jane distinguished by writing, art, and design. The title page displays a girl clutching a stuffed chimpanzee, and we meet both Jane and Jubilee at the beginning of the text. Jane loves the natural world and explores it; she makes drawings and notes of all she observes. In this fascinating world, she stays in the barn to watch how chickens lay eggs—all with her companion Jubilee. 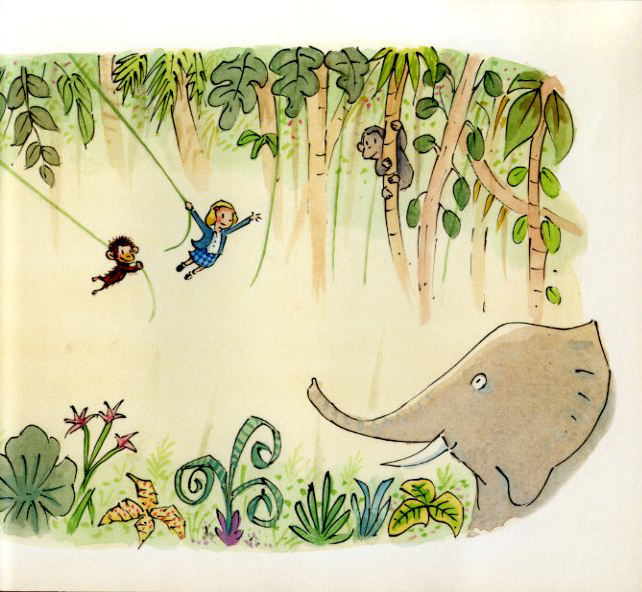 And she reads in trees, wonderful sagas of Tarzan, Jane, and the jungles of Africa. In a magical sequence, McDonnell shows Jane going to bed, saying her prayers, and dreaming of being in Africa helping animals. And then one day she wakes as an adult – and all her dreams have come true. Two drawings from Jane Goodall herself have been incorporated into this story along with actual ornamental engravings from nineteen- and twentieth-century texts. McDonnell has seamlessly woven these elements into his own India ink and watercolor drawings. Everything about the book has been chosen with care—the pleasing, and era-appropriate, Caslon Book font type, which has been distressed to look old. The cream-colored, weighty paper feels wonderful to touch. This is one of those rare picture books where every element has been given care and attention. But what is the most remarkable, certainly, is McDonnell’s ability to re-create Jane Goodall as a child, in the way that any child can appreciate. She and Jubilee seem totally real and believable. And he shows perfectly the relationship of a child and a beloved stuffed toy. Jubilee actually seems alive in the art—just as stuffed toys do to children. The final note, in which McDonnell talks about Goodall’s accomplishments as an adult, seems inevitable given what she cared about as a child. This message that your childhood dreams can, and do, come true will be welcomed by both parents and children. This original, fresh, and exciting picture book is destined for a long life of its own. Originally posted September 1, 2011. Updated for . An amazing book. An amazing man. Thank you for highlighting it and International Primate Day. This is a masterfully executed book. I was captivated by the illustrations but the book does truly work successfully as you mentioned with a seamless attention to writing, art, and design. This books strikes me as one that a child would pull off the shelf again and again. Maybe this will be one of those books that inspires another generation of naturalists and primate researchers. I really enjoyed this book, partly because it’s a biography of a famous adult that focuses on that person’s childhood only. It really does reinforce the idea that, as you stated,”your childhood dreams can, and do, come true”. This book is one of our new favorites! It caught my eye because my son sleeps with a sock monkey and I’m so glad I picked it up. Not only are the illustrations Caldecott worthy (in my opinion), the text is poignant as well. I love the description of an egg being hatched and Jane climbing the tree. It is a simple treasure, that celebrates a child’s special relationship with nature, which I fear is fading in our fast-paced, high-tech world. Our family might have to head to the zoo this weekend to check out our new chimpanzee exhibit in honor of today! I love this book. I am in the middle of watching a documentary about Jane Goodall in which Goodall shows off the real Jubilee. Jubilee still plays music but all his hair has been rubbed off. The documentary also includes the photo from the back of this book w- Goodall reaching out to a chimpanzee. I will definitely use this book in my own classroom. Not only is the story interesting, but it is also informative and draws on a number of other important themes. The nature illustrations help bring the story to life and provide a realistic visual for students who have never been in similar environments. Students learn that dreams can come true. However, it is our duty to help students brainstorm how to make their dreams a reality. Finally, the text teaches students to give back/strive towards humanitarian work. These are important concepts that I want my students to learn early on. This is a terrific book – and I must thank you, Ms. Silvey, for the outstanding new Untamed. I’ve been recommending both books – along with The Watcher – to everyone who will listen.